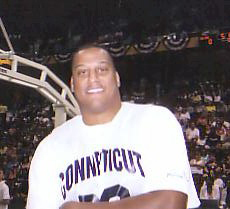 Tate George was a Guard for the UConn Huskies from 1986 – 1990. He’s a member of the UConn Basketball All Century Team, and was a player on the first UConn National Invitational Tournament Championship Team in 1988. Tate hit “the shot” to beat Clemson University in the National Collegiate Athletic Association Tournament Sweet 16 game, and was the first UConn player ever selected in the first round of the National Basketball Association draft. I had the opportunity to talk to Tate in August 2006, about his basketball memories, and experiences while at the University of Connecticut. Tate grew up in Newark, New Jersey. When making his decision on what college to get his education from, and what basketball scholarship to accept, he had narrowed his choices to University of Southern California, St. John’s University, Marquette University and Georgia Tech University, but chose UConn because he’d have more of an opportunity to play. “I wanted to go to a school that was going to provide me a chance to go out there and showcase my talent.” Tate also wanted to be away from home, and yet close enough to go home to see his family. Although most people probably think “the shot” in the 1990 dream season against Clemson in the NCAA tournament was Tate’s most memorable moment while at UConn, it wasn’t. Tate has fond memories of the rides on the bus with his teammates, and being a part of the team. “Being part of the organization, and the beginning of it is really what’s been important to me.” He didn’t elaborate on his personal accomplishments while at UConn, however through research I found that Tate had left UConn as the number one career assist leader, the number two career steals leader, had scored over 1,000 career points, and was named to several All Tournament teams during his four years at UConn. As far as future final fours go, Tate believes with the current coaching staff at UConn, and the top-notch players they recruit, UConn will be involved at some level to win a couple more championships. Tate had many complimentary things to say about Coach Calhoun.